"Sampath Speaking" - the thoughts of an Insurer from Thiruvallikkeni: 'A clear Blue sky' ... Jonny Bairstow presented gloves !! 'A clear Blue sky' ... Jonny Bairstow presented gloves !! Indian Cricket fan ~ do you remember that Oval Test of 1979 – when 438 in 4th innings looked gettable and how Srinivasa Venkatraghavan was treated ? After an interesting day 3 at Adelaide – the score card reads : Australia 8 for 442 dec and 4 for 53 (Handscomb 3*, Lyon 2*) lead England227 (Overton 41*, Lyon 4-60, Starc 3-49) by 268 runs. England can take solace that they still hold the Ashes. And they had the ball hooping and Australia's batsmen hopping in a tense final session on the third day. But lest anyone get carried away with this impressive bowling display, led by James Anderson, it is worth remembering that Australia lead by 268 runs, with six wickets in hand. Unless they can roll Australia for under 117, England will need their all-time highest successful Test chase to win this match. 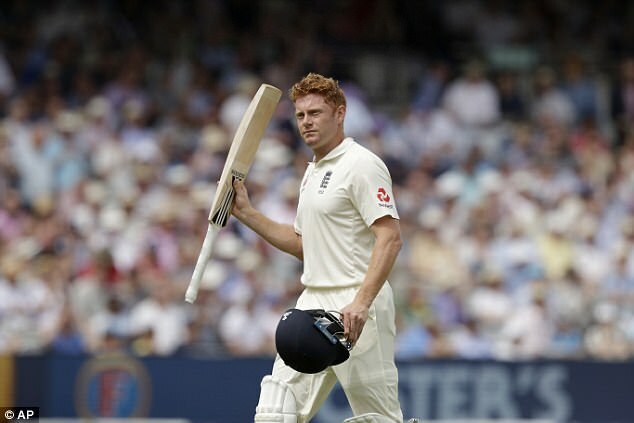 This is no match update but a post on England wicket-keeper Jonny Bairstow. Not many have the honours of father and son representing the Nation - coming from the Yorkshire club, both Jonny and his dad David have played for England, have kept wickets. Jonny Bairstow, the son of the former England wicketkeeper David Bairstow, is a combative wicketkeeper-batsman who has become a cricketer to be reckoned with in England's middle order. The journey was far from easy for Bairstow, especially with Jos Buttler in contention for the gloves, but prolific run-making for Yorkshire eventually made a case that England's selectors could not ignore. Galvanised by his selection, runs flowed. 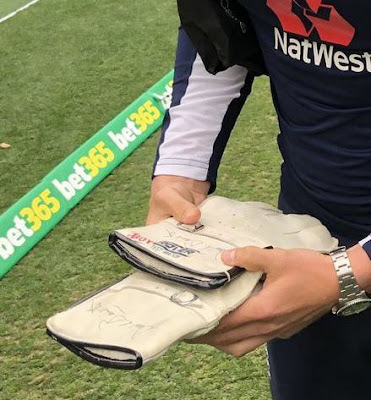 On Monday morning, a "fantastic gesture" from an Australian cricket fan in Adelaide saw England wicketkeeper Jonny Bairstow handed a special piece of family memorabilia ahead of the third day of the second Magellan Ashes Test. Johnny was given a pair of wicketkeeping gloves that had been signed by his late father, the former England keeper David Bairstow, on England's 1978-79 tour of Australia. Bairstow Snr, played four Tests and 21 one-day internationals for England between 1979-1984. Adelaide man Andrew Johns was given the gloves when he was a child and with the return of Bairstow Jnr to his home city, Johns was keen to reunite the Yorkshireman with the souvenir bearing his father's name. "A chap called Andrew messaged me on Instagram, actually," Bairstow told ABC Grandstand ahead of play on day three. "I don't really normally look at them (messages), but fortunately enough I did and (he had) a pair of wicketkeeping gloves signed by Dad in 1978-79. Having reached out to Bairstow, Johns was invited to the England team hotel on Monday morning to meet the England keeper and hand over the gloves. "We had a good half-an-hour, 45 minutes together, which was wonderful," Johns told ABC Grandstand… .. .. he was quite emotional to receive them, for his dad is now no more .. and that makes a sad story ! It was not to be a normal death. David Bairstow was found hanged at his home on January 5, 1998. He was 46. Reports said he had been suffering from depression: his wife was ill, he had financial troubles, he faced a drink-driving charge and was in pain from his own injuries. The news stunned cricket, especially as Bairstow had always seemed the most indomitable and least introspective of men, and led to much comment on the problems faced by retired sportsmen. David "Bluey" Bairstow was not merely the Yorkshire wicketkeeper but almost the embodiment of the country's cricket throughout the 1970s and 1980s. He arrived in county cricket amid a blaze of publicity when he was drafted from grammar school in Bradford into the Yorkshire side as an 18-year-old on the day he sat an English Literature A-level. His son was just 8 – and now Johny Bairstow has written a book - ‘A Clear Blue Sky’, being serialised in Sportsmail is more than just a cricket book. It is essentially the story of how the Bairstows have coped with the very worst that life could throw at them, from David’s suicide almost 20 years ago to Janet’s two battles with cancer. But, much more, it is the inspirational tale of a small family with a close bond who have come through the darkness and want to tell the world that, however bad things are, up above the clouds there is always a clear blue sky. As Jonny says: ‘Most people believe their family is special. I know mine is.’ At the centre of this incredible story is Janet, a well-known and popular figure at Headingley through her work as a cricket administrator for Yorkshire but now, a little reluctantly, thrust into the spotlight. It would have been a thoughtful and painful decision that after almost 20 years, have the Bairstows decided to reveal details of how David, at 46, took his own life the day before Janet’s 42nd birthday at a time when she was suffering from the first of the two bouts of cancer which she has fought so courageously and beaten. Jonny was just eight when, along with Janet and younger sister Becky, he returned to their home in Yorkshire after football training with Leeds United juniors to find David, a Headingley legend, had hanged himself. One of the most striking aspects of A Clear Blue Sky — a title which also gives a nod to David’s nickname of Bluey and how Jonny, initially reluctantly but then proudly, adopted the same moniker — is the lack of anger in the Bairstows. Tailpiece : 1: In numerical analysis, Bairstow's method is an efficient algorithm for finding the roots of a real polynomial of arbitrary degree. The algorithm first appeared in the appendix of the 1920 book Applied Aerodynamics by Leonard Bairstow. The algorithm finds the roots in complex conjugate pairs using only real arithmetic. 2: 4th Test, India tour of England at London, Aug 30-Sep 4 1979 – score card reads : Match drawn : England - 305 & 334/8d; India - 202 & 429/8 (150.5 ov) – score card would never reveal the high drama that unfolded on the final day when 438 in 4th innings was made to look gettable.